The year 2019 is dedicated to the Boar according to the Chinese zodiac calendar – for Canadians, 2019 welcomes the new food guide. The recommended eating choices is now leaning towards a plant based diet, and converges the previous separate groups of dairy and meat into one. Indeed, this may have a consequence for Québec producers, who dominate dairy and meat production in Canada – or it may not. Québec’s robust performance in meat and dairy sectors will not be impacted based on a recommendation guide but can only be affected with stricter regulations than the ones currently in place. The new Canadian food guide says to avoid processed food, to cook more often, consume protein, and choosing a plant based diet for nutrients which will also help the environment. Pork has a high protein index matching lamb meat (USDA, 2011) and needs to be cooked before consumption, these already meets two of the prior requirements; but to produce and maintain the porcine industry– it needs resources and impacts the environment. The main environmental impact of slaughter pig farming is the emission of greenhouse gasses and manure production, as well as its proper storage. Agriculture and Agri-Food Canada (AAFC) mentions that finding methods in reducing emissions per unit product would be more efficient in reducing greenhouse gasses – dairy farmers have reduced methane emissions by 13% and similar trends with beef and pork is occurring (AAFC, 2014). Another issue with swine is risk of diseases. 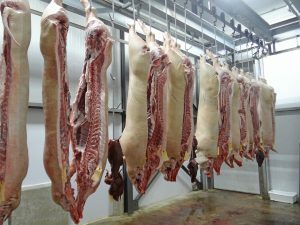 In the past there was the swine flu which affected small holdings, and recently, the African swine fever (ASF) that has affected swine in Australia. Biosecurity measures for swine farms by the Canadian Food Inspection Agency (CFIA) is offered and ASF has not affected Canada yet (CFIA, 2011). This does not mean all Québec farmers should switch to crop production for helping human diet and the environment. A research paper by Cornell University (2006) had shown in their study that high-fat vegetarian diet still supported fewer people than low fat meat diets; it also reached a conclusion that the carrying capacity of agricultural land for low meat diets overlap vegetarian diets – and that diets including meat can feed more people than vegetarians (Peters, C. J., Wilkins, J. L., Fick, G. W., 2007). The global economic market does not want the porcine industry to disappear. In 2017, Québec had a total of 8.7 million hogs, the most in Canadian provinces (Hog Production in Canada, 2017). The top three international countries that pork is exported to are U.S.A, Japan, and China. Starting from 2010, Québec’s export of pork had a value of 1.1 billion dollars (AAFC, 2011). Furthermore, in 2017, “pig type farms accounted for $1.9 billion in gross farm receipts” and accounted for 1/3 of all pigs in Canada (Statistics Canada, 2017). The market does not show any signs of stopping unless a new uncontrollable disease hits. Income security and work is supplied by the Assurance Stabilité de Revenue Agricole (ASRA), and la financière agricole du Québec (FADQ) with decision of la Ministère de l’Agriculture, des Pêcheries et de l’Alimentation du Québec (MAPAQ) is giving contribution for research and developing the porcine sector of Québec, as well as giving scholarships of $2000 to students in the agriculture department who will go into porcine industry (Les éleveurs de porcs du Québec, 2018). With the federal and provincial governments giving incentives to continue production, the new food guide’s promotion of going green will not affect the quantity of red produced in slaughterhouses. The New Year brings in festivities to celebrate the pig, and incentives from government seem to show that it will definitely be a piggy year. Agriculture and Agri-Food Canada. (2011). Canadian Pork. Available at http://www5.agr.gc.ca/resources/prod/Internet-Internet/MISB-DGSIM/CB-MC/PDF/4664-eng.pdf (accessed 8 Feb. 2019). Agriculture and Agri-Food Canada. Agriculture and Agri-Food Canada (2014). Measuring emissions [policy]. Available at http://www.agr.gc.ca/eng/science-and-innovation/agricultural-practices/climate-change-and-agriculture/greenhouse-gases/measuring-emissions/?id=1329321977257 (accessed 8 Feb. 2019). Agriculture and Agri-Food Canada. https://www.fsis.usda.gov/shared/PDF/Pork_Lamb_Nutrition_Facts.pdf?redirecthttp=true (accessed 8 Feb. 2019). Food Safety and Inspection Service-United States Department of Agriculture, Washington, DC. Free Image on Pixabay – Pig, Pork, Slaughterhouse, Butcher. Available at https://pixabay.com/en/pig-pork-slaughterhouse-butcher-1985380/ (accessed 8 Feb. 2019). Government of Canada, C. F. I. A. (2011). African swine fever [reference material]. Available at http://www.inspection.gc.ca/animals/terrestrial-animals/diseases/reportable/african-swine-fever/eng/1306983245302/1306983373952 (accessed 8 Feb. 2019). Statistic Canada (2017). Quebec leads in dairy, maple, pigs, and fruit, berries and nuts. Available at https://www150.statcan.gc.ca/n1/pub/95-640-x/2016001/article/14804-eng.htm (accessed 8 Feb. 2019). Government of Canada. Hog Production in Canada. (2017). Available at http://www.canadapork.com/en/industry-information/hog-production-in-canada (accessed 8 Feb. 2019). Canada Pork International. Les éleveurs de porcs du Québec. Investir Ensemble-Rapport annuels. Available at http://www.leseleveursdeporcsduquebec.com/8-2-notre-organisation-rapports-annuels.html (accessed 8 Feb, 2019). Québec, CA. Peters, C. J., Wilkins, J. L., Fick, G. W. (2007). Testing a complete-diet model for estimating the land resource requirements of food consumption and agricultural carrying capacity: The New York State example. Renewable Agriculture and Food Systems, 22(02), 145–153. https://doi.org/10.1017/S1742170507001767 (accessed 8 Feb. 2019). Published by naynaahmed on February 10, 2019 at 11:05 am under Uncategorized. 2. Even if the public seems to be turning away from meat consumption for nutritional and environmental reasons, pork production won’t slow down and will continue to bring high revenues to the Canadian agricultural sector. 3. All the numbers and statistics support a lot the arguments, as they provide proof of what the text is explaining. 4. The strongest argument in this article is the one about greenhouse gas emissions because it is often one of the main concerns people have when considering to eat meat or not. 5. The article takes many different directions and it can get confusing for the reader. I would suggest to maybe use less arguments, but explain them in more details keeping one main idea for the whole thing. This is a short article, so I think sticking to less arguments will make it more effective and stronger. 2-	While the 2019 Canadian food guide is promoting a plant-based diet, the pork industry in Quebec is here to stay – if Quebec can help it. 3-	This is an accessible article that provides a good introduction to the pork sector in Quebec. There is use of humour and a lot of information for individuals that would not otherwise know about this industry, which was appreciated. 4-	When the author mentioned the financial assistance options for farmers and researchers in the porcine sector, it showed that the presence of this industry in Quebec is vital and, for that reason, the province would ensure its perpetuation. Mentioning the economic importance of the sector in Quebec and Canada also reinforced this point well. 5-	Developing further the most important arguments rather than presenting statistics, facts or claims may help the reader better follow the flow of the article and understand the message behind each argument. Making the reference style and format more uniform would also be a little way of improving this great article.